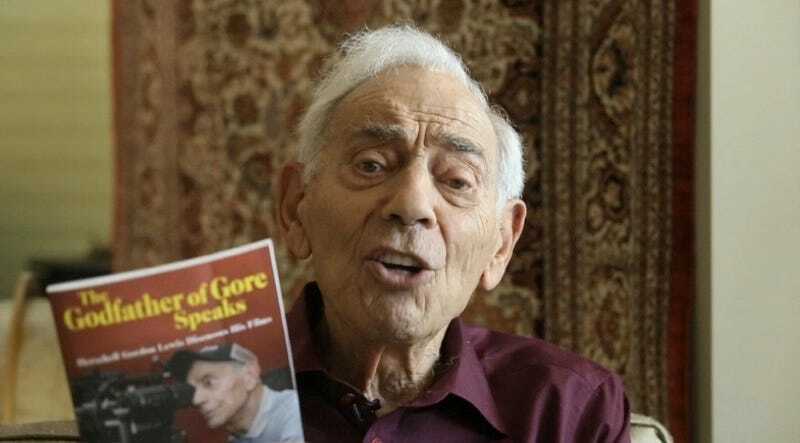 It is a sad day for horror-movie cultists: Herschell Gordon Lewis, the “Godfather of Gore” and director of exploitation classics like Blood Feast, Two Thousand Maniacs!, and The Wizard of Gore, has died at age 87. Lewis wasn’t just a director—he also usually wrote the script, ran the camera, and composed the music, too, often using a pseudonym (“Sheldon Seymour” was a go-to) just so his name wouldn’t run throughout all the credits. And he was a master of marketing, a skill that would lead into his primary, very successful career once he left filmmaking. But he never really left filmmaking. Thanks to home video, his films were discovered by cult-movie enthusiasts and the Godfather of Gore’s star rose anew. He was even tempted out of retirement to helm 2002's Blood Feast 2: All U Can Eat, as well as a few other subsequent pictures. And he was always delighted, if a bit baffled, by his fans. You could see how a guy who went on to have a respectable career in advertising would want to downplay his exploitation film past, but Lewis never did that. He was a class act—a very nice guy with unusually well-tuned business sense, who figured out that pointing a camera at someone getting their (fake) tongue ripped out would sell a lot of movie tickets. He was right. And he saw no shame in that. Though Blood Feast made him famous, Lewis was often asked which film of his was his favorite, and he always said Two Thousand Maniacs! Like Blood Feast, the trailer opens with an elaborate warning. Unlike Blood Feast, it goes right into a hillbilly-tastic banjo tune... written by Lewis, of course.